Diet Coke didn't have saccharin (heard what THAT did to rats) and it tasted, well, sweet! That was before research that shows that ANY artificial sweetener may be a bad thing - see Three Reasons to Rethink that Diet Coke You’re About to Drink. A few weeks ago, I attended an event where the parents brought drinks and someone showed up with this "Polar Seltzer with Cranberry Lime". My 4 year old got so excited! After a quick review of the can - ingredients: carbonated water, natural flavors - I said, "YES! Soda! You can have ONE can." Then, I grabbed one myself. Now, there is one sitting on my desk as I write this. slurrrppppp. I bought a 6 pack for $2 and as a refreshing summer drink this REALLY hits the spot. There is something about holding a cold can that is just so satisfying in the summer months. I LOVE taking one of these out of the fridge and just hearing the sound as it opens. Try putting it on the back of your neck when you get super hot. It is like diving into a cold pool. The best part is that there is ZERO sweetener and it tastes like there is! The magic of a little cranberry-lime flavor is that you think you are drinking something with sugar in it - but there isn't any. Yes, I am crazy about this stuff and it comes in all different brands and flavors. Some of my favorites are mandarin orange, lemon, and lime. These naturally flavored seltzers are typically less expensive than soda (and much cheaper than beer!). Give them a try to stop yourself from drinking juice or whatever it is you grab to be refreshed. Serve them at a party or barbecue and be amazed when no one asks where the Diet Coke is stashed. Do you like flavored seltzer? As readers pointed out below, if you can't find a brand you like at your local grocery store or if you prefer to make your own soda at home you can also try the Sodastream soda maker. You can either use Sodastream's MyWater flavors or squeeze some lemon juice in the glass when you serve. Their site says they sell it in some areas of Ohio, I'll have to see if I can find some! It's so funny - this is exactly the brand and flavor I buy. I was always a tap water drinker but I have been drinking 3 or 4 cans a day since I have been pregnant. Looks like a pretty good alternative! Yes! Too bad these types of drinks aren't more widely available. I remember in Seattle I loved Talking Rain, which I can't get here in Texas. It's only Canada Dry at the local store. We are going through seltzer (flavored and unflavored) at a mad pace, such that we're thinking of buying one of those home carbonators. So refreshing! And once I took a pregnancy-induced vacation from Diet Coke and Pepsi, then tried it afterwards, I realized it tastes like crap. (Can I write "crap" on your blog?) So now on the rare occasion I really want a caffeinated soda, I have a small can of the real thing. But on a daily basis--seltzer, baby! LOVE it! It took me a bit to get used to the taste, but now I can't live with out it. Loving Polar's new summer-time flavors as well! 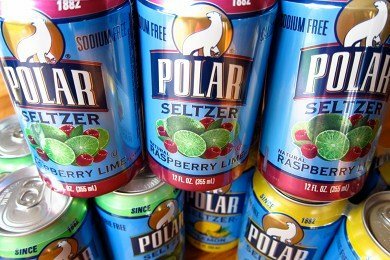 I love the cranberry-lime seltzer from polar! It's got the fizz I like without all the stuff I don't want. This is our "go to" beverage at our house... love flavored seltzers, we actually go through about 3 12-packs a week - Polar is great, but store brands such as Chill (Shaws) and Zazz? (Stop & Shop) are also good. We don't have Polar here in Colorado, but we do have LaCroix which I love! Also, King Soopers has a store brand which isn't bad either. been drinking this for years and loving it. I agree with Maria, the store brands are great as well. Stop and Shop Tropical fruit is just yummy! Buy a SodaStream and get their MyWater flavors (unsweetened, natural flavors) The kids love to "make" the water, there's no cans or bottles to deal with, stuff doesn't go flat because you make it as you use it and it's much more economical. Thanks for sharing! I'll have to check into it. I read something the other day that carbonated water is not good for you that it leaches the calcium from your bones. I'm not sure if that is true or not but I found it interesting. Have you heard of that? I stopped drinking all soda about 8 years ago. I drink lots of water but the funny thing is when you do that you get picky about what kind of water you drink. Then it was getting a little boring. I discovered certified pure essential oils this year and now I drink my water with flavors,,,whatever flavor I like...lemon, lime, wild orange, etc. Because these are PURE and are CERTIFIED that they are PURE they are safe to drink or use in cooking. They have one that people are loosing weight on which is great! Keep telling us about new and interesting products that are healthy, l love it! Hi~ can I find Polar in the Midwest? Like Indiana .... This summer I have been an iced Green tea and lemonade girl. But Polar sounds like a refreshing change. thanx! Pour either orange juice or grapefruit juice into a tall glass filling only about a third-then add plain selzer to it! Yummy! Instant soda much like an "orangina"-love it! I drink these too, except its a brand called La Croix.. don't quote me on the spelling please. Love them, and yes, cheaper than a 12 pack of diet coke! Flavored seltzer is my new favorite! It's refreshing and tastes delicious. I haven't found a place in DC where they sell Polar, but I am going to look into it. My favorite flavors are triple berry and vanilla. Ha ha...this has been my saving grace in my journey to free myself from Diet Coke. I feel like I am doing something illegal when I come down at 10 PM and pop open a can. My favorite flavor is the Pomegranate! Now I NEVER buy Diet Coke for the house, but I stock this in bulk! I still get diet coke at restaurants, though. Oh well. We got a SodaStream last year - make your own! Control the fizz! Squeeze a lemon in it! Or drop frozen raspberries in, and let them dance around and flavor it while they thaw. Ok this sounds awesome, but not sure where to find it in NC! My parents have a "soda maker" but thats WAY to much time....got 2 toddlers!!! !